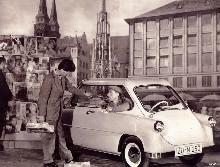 ZUNDAPP started life in 1917 as 'Zunder and Apparatebau GmbH', a munitions factory situated in Nuremberg. After WWI, the company were obliged to abandon munitions development and were renamed 'Zundapp Gessellschaft fur den Bau von Specialmaschinen' building tractors and electrical equipment. Motorcycle production commenced in 1921 and by 1924 over 10,000 were sold. In November 1931 when motorcycle sales slumped, Dr. F. Neumeyer, the head of Zundapp, approached the newly established design bureau set up by Dr. Ferdinand Porsche with the intention of moving into car production. Porsche had been working on a 'peoples car', known as 'Project No.12', but in September of that year, the idea had to be shelved due to lack of finances. He wanted to adapt his ideas to the new project, but his intention to use an air-cooled three cylinder radial engine was rejected by Zundapp who insisted on using a 1.2 litre water-cooled five cylinder radial engine. Three prototypes were built by Reutter, the well known coachbuilders of Stattgart, but Zundapp cancelled the project on the grounds that the cars would be non-profitable and returned to motorcycle production. All three prototypes were later destroyed in air raids. When Neumeyer died in 1935, it was taken over by his son, Hans Friedrich and the company was re-named 'Zundapp-Werke GmbH'. Aero engines were added to the list of products and their production of military motorcycles numbered 250,000 by 1942. The factory was virtually destroyed during WWII and, under American control, started to build, under licence, a unique Dornier designed four wheeled car called the 'Delta". Body pressings were kept to a minimum and an identical locking door was fitted to the front and the rear of the cabin. A single cylinder, 2 stroke engine of 248cc was placed centrally between the back to back seats and the rear seat passengers faced backwards at all times. Re-named the 'Janus', it took its name from the Greek God who faced both ways.